While Coles and Woolworths continue their battle for the hearts of Australian supermarket shoppers, including some questionable ‘in-school’ marketing tactics, some smaller players are finding their feet. One of the major news items on Monday the 5th of September was the revelation that the supermarket arm of Coles Myer had engaged in some unusual and difficult-to-believe marketing tactics. Supermarkets going straight to the kids to get feet through doors is nothing new – going to the kids during school time is. According to numerous news postings, Coles marketing representatives have been donating millions of dollars of sporting equipment to get their foot in the door of hundreds of schools around Australia (in some reports the number is up to 7500 schools nation wide). Once the school ‘assemblies’ have been called, Coles reps dish out prizes to the kids who sing the ‘Prices are Down’ jingle. A little terrifying yes – the last thing any parent wants to do is come home from a stupidly busy day at work and be faced with their kids blasting them with supermarket messaging. The whole thing verges on creepy. 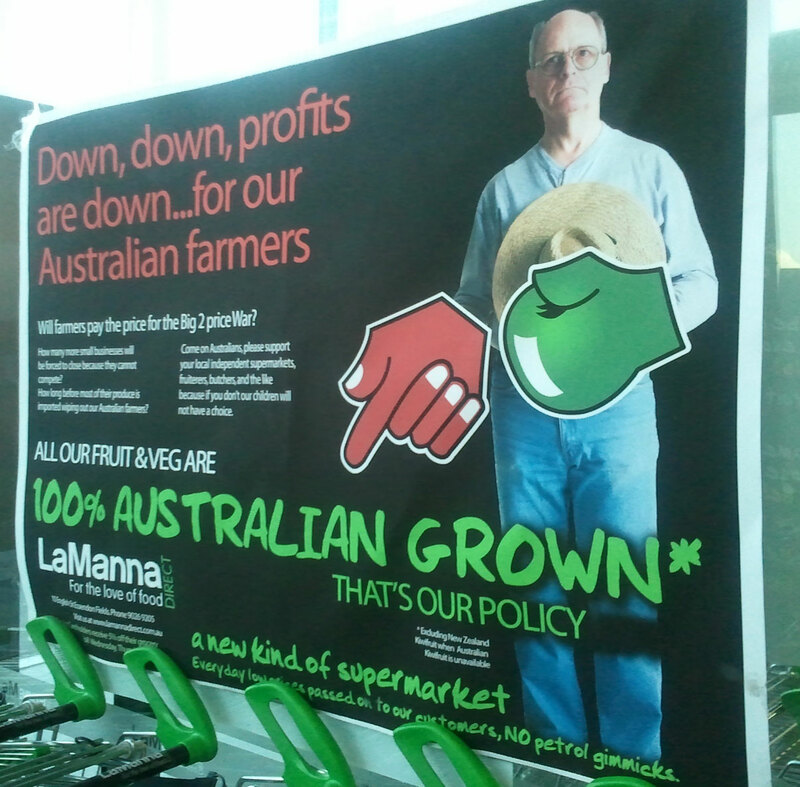 Is this what consumers are expecting from their supermarkets – brainwashing under the guise of supporting local schools? Why does it need to come to this? A few months back I made a journey through the USA, stopping at supermarkets to get a feel for the difference. Oh, the choice. If you ever had any doubt that America was the land of pure capitalism and free choice, head to one of their supermarkets. The Nugget was a special favourite – a warehouse filled with thousands upon thousands of products, edible and not. It was astounding. 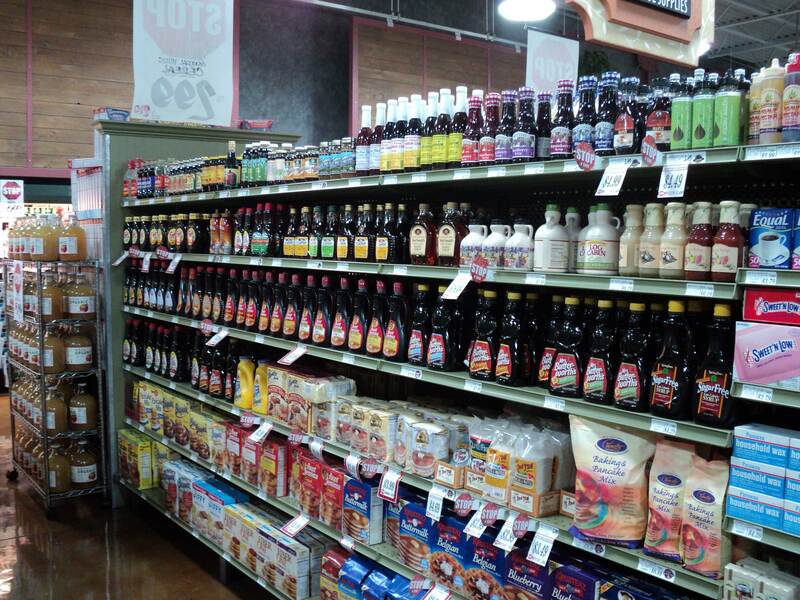 The pancake and maple syrup section took up an entire 20-metre isle! After moving to the Melbourne suburb of Brunswick a few months ago, I’ve been actively attempting to avoid both major supermarkets for my shopping needs, to see if I could get the quality of choice I witnessed overseas (and as a little bit of a protest to their ‘self-brand-shelving’ tactics – why don’t they stock the mustard I like any more?). The Victoria Market isn’t too far, and there are any number of food, vegetable and meat stores through the neighbourhood… but you still need to go to a supermarket for some basic goodies (the choice of these goodies, however, is incredibly limited). 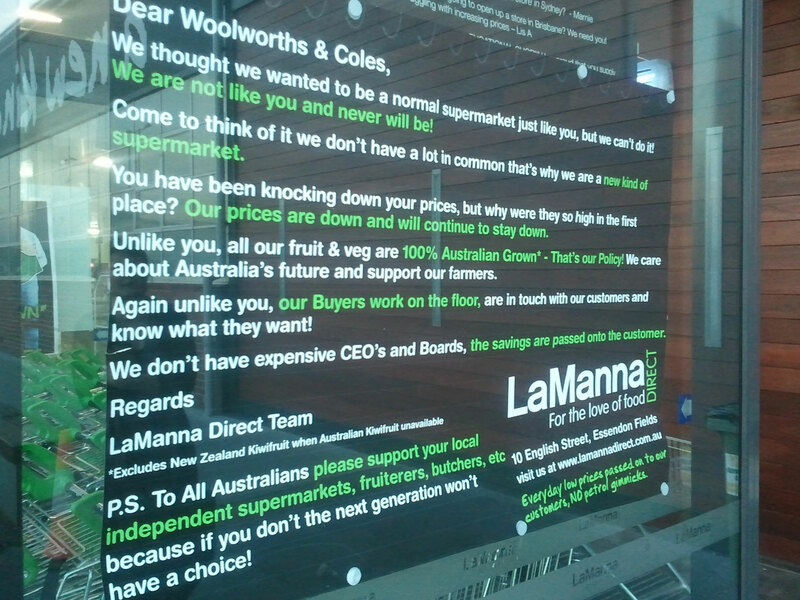 Then I found La Manna Direct in Airport Fields (near Melbourne Airport). This place puts the warring supermarkets to shame. Why? Because it’s not about only having two choices of toilet paper, or one type of mustard (that’s a self-named brand). The La Manna name has been around Melbourne for at least 50 years through its involvement with the fruit and vegetable market scene (including a number of fruit shops throughout the city). Its message is about having a choice, kept inexpensive by the store’s owners, in an environment that is conducive to decision-making.